Homo naledi assembled skull (Berger et al. 2015 http://elifesciences.org/lookup/doi/10.7554/eLife.09560.019. Licensed under CC BY 4.0 via Wikimedia Commons) In Part 1 of this post, I described the unlikely discovery and pretty fantastic recovery of a major cache of heretofore-unknown hominin bones. In Part 2, I laid out the mosaic traits of the new species, Homo naledi, and talked about how the consensus came to be that despite its tiny orange-sized brain, this species used fire to light their way through the cave to repeatedly and deliberately dispose of their dead. All of this, I’d argue, is just awesome. 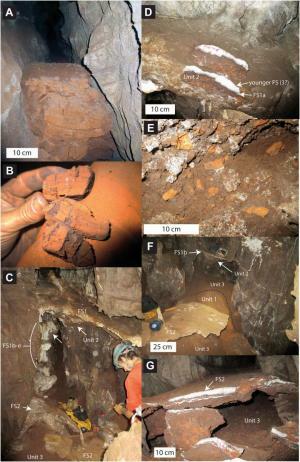 A new hominin with a tiny, but apparently pretty powerful brain, was navigating cave passages Indiana Jones style to dump dead bodies? That’s just fabulous and interesting and enough to make me want to go back in time to become a paleoanthropologist! But unfortunately, there is one big, glaring issue with the discovery that is preventing it from reaching its full “find of the century!” potential: No one knows how old the bones are because they aren’t embedded in dateable sediments or rocks. Berger insists that they are working on ways to pin the age down, but as some methods would involve destroying bones, they wanted to catalogue them all before they tried. He also is confident that “no matter what the age, [H. naledi] will have a tremendous impact.” And I’d agree with that—we know it’s new, so it can’t help but give us new insights into human evolution, no matter where on the tree it ends up...but the sooner we know the “when” the better. I began Part 1 of this series by saying that “I can’t imagine any biology teacher won’t want to spare a few minutes from the back-to-school “here’s how science works” introduction to talk about [this new discovery].” To bring us full circle, I want to discuss a few ways educators can bring H. naledi into your classroom. I read last night about one lucky teacher from Dallas, TX, who was able to show his students videos of himself interviewing Lee Berger in South Africa. The teacher, John Mead, had formed a friendship with Berger and had the means to travel to South Africa several times to visit while the H. naledi drama was unfolding. So, right after the official announcement of its discovery was made, Mead was able to show videos he had made in South Africa to his students. Not a lab coat or beaker in sight. (Paul H. G. M. Dirks et al http://elifesciences.org/content/4/e09561. Licensed under CC BY 4.0 via Wikimedia Commons) Obviously, that is not possible for most of you (though Mead did make his videos available online). But you don’t need to have such insider access to bring Homo naledi into your lesson. Simply telling this story to your students will help to dispel so many misconceptions about how science works. There are no lab coats in sight, for one, and far from this being a solitary pursuit, Berger assembled a huge team to help him get the bones and then describe the finds. And the finds aren’t about facts that you need to memorize, they’re dynamic inferences subject to change when new information becomes available. This is real discovery in real-time. And there is another reason to talk about Homo naledi: this is our story. Wherever it ends up on the tree, Homo naledi is on OUR tree. It’s more evidence that evolution isn’t something separate that happened once upon a time to finches and lizards and snails—it happened and is happening to us. Me: Hiya! 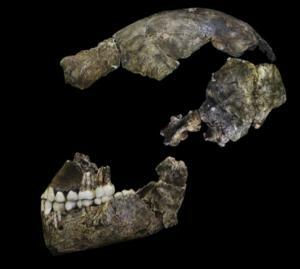 I’m going to be writing up something general for the blog on H. naledi. Would you be willing to contribute or fact check me? I have my big picture already figured out: Human ancestors are awesome. Briana: Sure… and heck yeah! Hominins are always awesome. So there you have it, from the mouth of an expert. 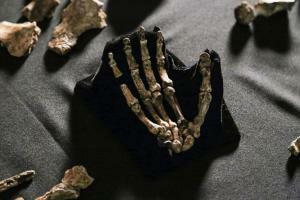 Why bring H. naledi into your classroom? For all the reasons described above, or simply because of the fact that hominins are always awesome.